Does OPEC Really Control the Price of Oil? In spite of the best-laid plans of the Saudi oil empire, the price of crude oil cannot easily be manipulated to exorbitant levels. There are far too many oil producers, insufficient restrictions to free trade and far too many promising energy alternatives to allow Americans and others to be hindered by oil hording. The Organization of Petroleum Exporting Countries (OPEC), an eleven-country group of which Saudi Arabia is a member, controls two thirds of world petroleum exports. Despite the fact that five countries with very large oil reserves (Saudi Arabia, Iraq, United Arab Emirates, Kuwait and Iran) are OPEC members, their power is not all pervasive. The six or so non-OPEC oil producing countries (including Russia, which rivals or exceeds the Saudi production) often produce and sell more oil than OPEC suggests, which keeps prices far below the highs of the seventies, and sometimes below OPEC's preferred floor of $20 per barrel. Reuters reported that U.S. Treasury Secretary Paul O'Neill said in early March that U.S. crude oil prices should be between $18 and $25 per barrel to stimulate U.S. and global economic growth. World energy markets have held that range since last September, but only time will tell if it endures. 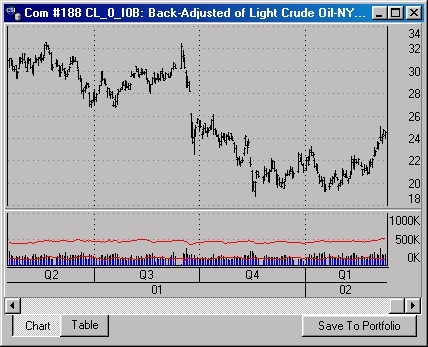 The falling and rebounding Crude Oil market. Will world markets and competing energy sources keep prices relatively low? Chart Source: CSI Unfair Advantage. Think of the crude oil supply as a huge swimming pool, supplied by all world sources through a funnel at one end. A drain at the other end supplies consumers to meet over 40% of all world energy needs. The international price of crude depends on how full that global swimming pool is maintained. OPEC claims no direct control over oil prices. They are quick to point out that traders at regulated exchanges set the price of oil, and that local government taxes typically overwhelm the price of raw crude in the overall price of fuel. OPEC's stated goal is to assure a stable oil supply at sustainable price levels. Their methods rely solely on setting production and export quotas or limitations. Not coincidentally, the natural laws of supply-and-demand take care of the pricing for this scarce commodity. OPEC aims to control the spigot on the funnel leading into that pool of oil. The price for the fuel coming out is largely, but not entirely, dependent upon their policies. 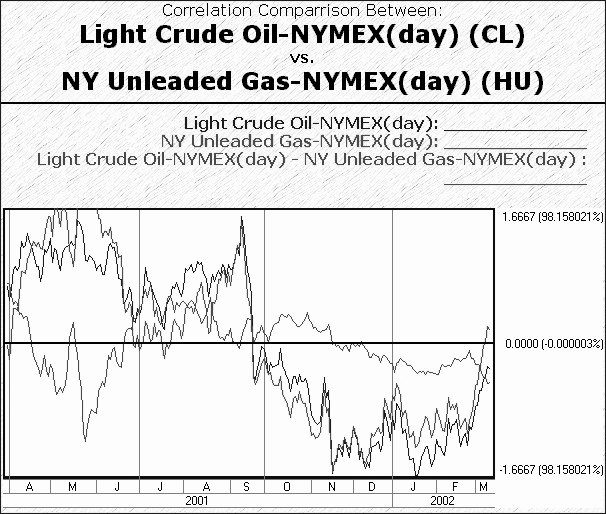 This chart demonstrates the highly correlated relationship between the price of Crude Oil and the price of gasoline, which are moving together (measured in standard deviation) The trader might focus on the lonesome line oscillating around the center axis, which demonstrates the spread trading opportunities (based on the price difference) that exist for this pair. Chart Source: CSI's "Tomorrow's Newspaper Today.". The cooperation of non-OPEC countries would be necessary for OPEC to maintain the supply/pricing levels they desire, but cooperation is often lacking. The Moscow Times reported that even in Russia, where the government has agreed to OPEC's request for a curb of oil exports by 150,000 barrels per day, oil producers are said to be using everything from river barges to rail trucks to export oil products, circumventing the state pipeline and boosting world supply - outside of the agreement with OPEC. Russia is a formidable ally or foe to Saudi Arabia in the oil business, as each country is responsible for about 18% of world crude oil production. Worldwide compliance or noncompliance aside, recent reports from the Middle East tell us that OPEC has no plans to loosen its stringent supply curbs through June - at least. This leaves some concern here in the United States (the world's biggest oil consumer) that OPEC may have sufficient control to allow demand to exceed supply later this year, forcing prices to rise. This rise, should it occur, will not be overwhelming. The Saudis know very well that they cannot allow the price of crude to move beyond a reasonable level without encouraging competing sources to emerge. As the pool of crude is drawn down, oil energy becomes more expensive, making alternative energy sources more attractive. Under the right circumstances, sources like wind, tide, coal, natural gas and others could permanently displace portions of the crude oil demand. Hydrogen fuel cell technology is developing here in the U.S., resulting in energy that is not only cheaper, but also cleaner and more sustainable than fossil fuels. The California Fuel Cell Partnership, a collaboration of auto companies, fuel providers, fuel cell technology companies and government agencies, is already working to place a fleet of fuel cell electric vehicles on the road in California. Yes, this is already becoming a threat to oil. A report in the March 2002 Scientific American represents that the U.S. could quickly get "at least 12 percent of its energy from wind." Currently only one-half of one percent of U.S. energy supplies come from wind. In Denmark 50 percent of their electrical energy comes from wind turbines. It is examples like this that the Saudis do not want to encourage by allowing crude prices to rise beyond competitive levels. If the world, particularly the U.S., were to move into this area and other alternative fuel sources more forcefully, demand for OPEC's oil would drop significantly. The '911' attack caused a slowdown for the economies of the world, which reverberated in the oil market by reducing demand. Air travel and overall commerce declined, reducing the need for crude. Other factors of demand also contributed to a drop in the cost for fuel. In another demand-related scenario, a forthcoming El-Nino weather pattern is apparently forming. Historically, this phenomenon has warmed the U.S. sufficiently to produce a reduction in the fuel oil requirements. Although perceived as a threatening world weather pattern, Science News reported that earlier incidences of El Nino have benefited the U.S. by substantially reducing the demand for crude oil. Some $15 billion have been saved in U.S. economic costs per El Nino occurrence. This dual chart shows Natural Gas prices generally trending in the $2 to $6 per MBTUs (spiking to over $10), while the price of Enron went from a high of $90 to less than $1 per share before bankruptcy. The casual observer can clearly see the high correlation between the fortunes of these two markets. Our question is, "Why aren't they inverse?" Chart Source: CSI Unfair Advantage. The Enron trouble may have affected the cost of energy by way of the company's positions in the natural gas markets. 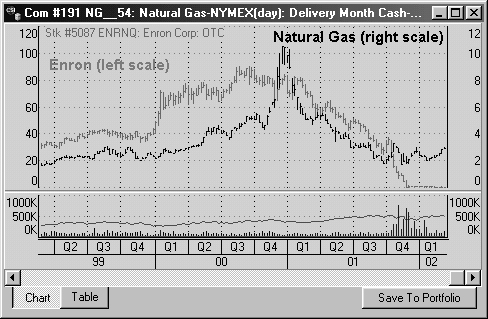 The chart (above) shows a pronounced spike in the price of natural gas in the 4th quarter of 2000, marking the end of Enron's heyday. It is painful to imagine being a survivor in a long position during the ensuing calendar year when the market suddenly dropped by the magnitude (perhaps 80%) shown here. Enron's demise involved more than just a volatile market. U.S. regulators and Enron's accounting practices both helped to bring that company down. OPEC claims to have an 80-year reserve of fossil fuels, so although crude oil will remain a prominent source of energy for the foreseeable future, this will eventually come to an end. For now, there is probably no physical commodity that is as important to our world. Economies respond to the cost of energy like no other product and decades will pass before any product can become a meaningful substitute. For now, oil is needed to plow the fields, fuel our military, heat our homes and power our electrical plants. Until another emerging technological marvel takes hold, (and surely one will) crude oil will remain top dog. Nevertheless, its producers are unlikely to take full control of world economies. If you are interested in a tailored methodology for exploring market opportunities with a non-mainstream approach, we suggest you look into the VantagePoint tools offered by Market Technologies. You may have already read what John Murphy, technical analyst for CNBC has written about this intermarket/neural network analysis product. VantagePoint's recommendations to daytraders and spread traders make extensive use of CSI's world futures coverage. Visit Market Technologies' website at http://www.profittaker.com or call them at 1-800-732-5407 for more information. For information only. CSI does not endorse outside firms.